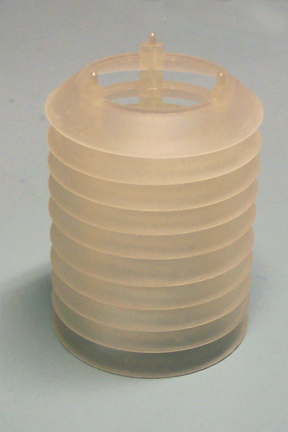 This splash guard holder is the one that comes with many of our misting fountains. It is the plastic part that the mister sits in and it is used to support the glass splash guard. This part is compatible with the ch-24. If your mister has a larger diameter than that one, then you will want one of the other holders we carry: Splash Guard Holder B or Splash Guard Holder C. When using a mist maker, you need this part to hold up the little glass dome. These parts together will prevent water from shooting out of the bowl as the mist is made. It will keep all the larger splashes in, but allow the heavy, natural mist to float right out. Some fountains will have a metal wire support, and this holder will work perfectly to replace those as well. This particular holder is easily customizable for the ideal installation. Any number of sections can be removed to make it the perfect height, and the cord for the mister easily threads through between sections. This part may be used to make your own fountain or to replace a broken one from an existing model you have now. It is also integral to any sort of custom humidifier or other project because as the misters generate fog, there will always be a bit of splashing that needs to be contained. These plastic risers are designed to last for years, but due to accidents, loss, or heavy use, you may need to get a new one. This part will be perfect for any number of uses, and the main thing to pay attention to is that the mister you have, or the one that you are ordering now is the right size to fit inside this holder. Splash Guard Holder A - Repair a broken fountain or make your own with this replacement part. Use it to support any glass dome and house your misting device. The splash guard works great. I would love to order another one but it seems you guys run out of stock very quickly.